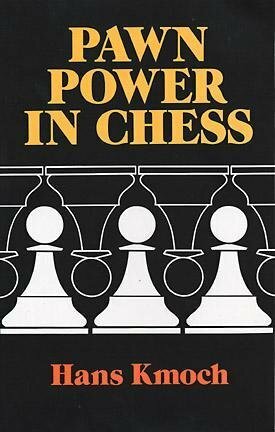 Pawn Power in Chess appeared in the 1950s and was the first book to deal extensively with the topic of different types of pawn structures. It was an original work, but filled with jargon and mainly covered Ruy Lopez and Benoni type structures. Original discussion of pawn play isolated by elements and elaborates on various aspects. Difficult to read because of the terms to describe what he is discussing. Kmoch uses awkward phrases like "leucopenia," when referring to white square weaknesses but if you can get past this, the book is full of whole sections on different pawn structures: the King's Indian, the Dutch Stonewall, Dragon formations, etc. Kmoch discusses the key features of the positions and then presents a set of complete games with light notes to illustrate the themes in practice. Chess author and translator Walter Meiden did everything he could to persuade Kmoch to abandon his special terminology but Kmoch was adamant for reasons known only to himself and refused to do so. Despite those flaws this book will be a benefit in all three phases of the game: opening , middle game and end game . I heard there is a debate between which is better, this one or the book by Soltis. What is your take?